Join Joey and Rachel for Saturday morning Mysore-style Ashtanga at their cosy home studio. Join Joey and Rachel for small group Sunday morning Mysore-style at their intimate home studio. 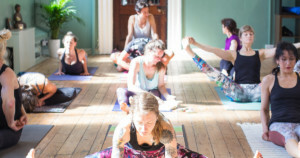 A chance to immerse yourself in yoga practice during this full day Ashtanga workshop with Joey Miles and Rachel Woolhouse at their beautiful home studio. A small group weekend Mysore-style class with Joey Miles at his intimate home studio in Mytholmroyd, near Hebden Bridge. Join Joey and Rachel for a small group Mysore-style class at their cosy home studio in Mytholmroyd, near Hebden Bridge. To Prop or Not to Prop?